Rock Or Bust sheet music arrangements are below. Angus Young, Brian Johnson, Malcolm Young, Ronald Scott (also known as Ronald Belford "Bon"), Axl Rose (also known as William Bruce Rose Jr, William Bruce Bailey, W. Axl), AC/DC is the author of Rock Or Bust. A one page preview of Rock Or Bust can be seen for each available score by clicking on this button next to the relevant score. You can easily modify the instruments for which you are viewing all currently available sheet music scores. All you need to do is change the instrument selected (the default is "All Instruments") in the box next to the instruction: "select instrument". You can post your customer feedback on any of the Angus Young, Brian Johnson, Malcolm Young, Ronald Scott (also known as Ronald Belford "Bon"), Axl Rose (also known as William Bruce Rose Jr, William Bruce Bailey, W. Axl), AC/DC arrangements on this song page. Navigate to the Comments tab below, make sure you are logged into your Great Scores account, and after choosing a username, which from then on will be permanently assigned to you for leaving comments, you can type in your review. No spam or URLs, please, as these will be deleted. If you'd like to email this page to a friend, then you can easily do this by clicking on the share button on this page. You can also choose to post to your FB wall, tweet the page on your Twitter account or use other social media such as Digg, Linkedin, Delicious and many others. 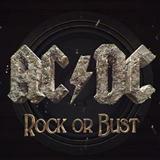 Our song catalogue currently features 1 arrangement of Rock Or Bust. Additionally you can at present select from 1 instrument to purchase for.